The first week was eventful week for many reasons. 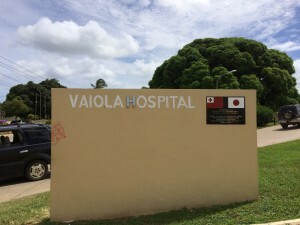 I arrived in Tonga to begin my first placement at Vaiola hospital on Tongatapu island only to find I had arrived the same week as the passing of the the Queen Mother. What this means for the Kingdom, is a royal funeral – I can’t say I’ve even been to one before. The day I arrived was the day before the actual funeral. My hosts picked me up and we talked through what all of this meant. Queen Mother had arrived from Auckland that day, and the 20 odd kilometres that marked her journey from the airport to the burial ground were lined with children awaiting her return. 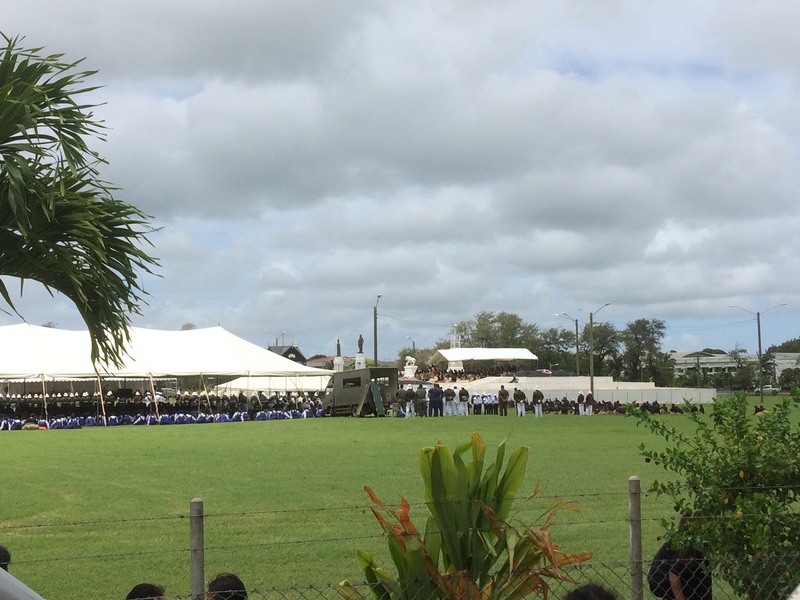 On the day of the funeral, we dressed in black and the traditional Tongan ta’ovala – a woven mat that is worn around your body. These signify your deep respect for the royal family; the older and more tattered it is, the better. We arrived at the royal burial grounds to witness the pall-bearers, some one hundred of them, carry Queen Mother to her tomb. Traditionally, these people then sat at the tomb for 100 nights, where they could not use their sacred hand for anything. They are relieved of their position only by their eldest son to use bathrooms and eat, then must return to the tomb. It is a great honour to be there. After this funeral, which was on a public holiday, life started to head towards normality. The hospital staff were to wear black clothing only, for at least 10 days in mourning of Queen Mother – a feat that while it sounds simple, I found difficult in 30 degrees with 80-90% humidity! I finally began my first day at Vaiola hospital, on Paediatrics where I’ll be for the next short while. After just over a week here, it has been an excellent experience for many reasons. While this hospital isn’t the most rural in Tonga, it is by no means full of resources. Vaiola acts as a hub for many services, operating with what they can. Consequently, I have been learning to think and act a little more laterally to help patients here when resources are unavailable. I have found this feeling similar to working in a rural GP environment in New Zealand – you don’t have everything at your door, so you improvise. Another thing that I once again appreciated was vaccines. The vaccine schedule in Tonga is different to New Zealand, and I became very thankful for the regime we have. Due to the limited funding here, many vaccines, such as meningococcal, are not done here – unfortunately, despite cases of the disease. It did raise the importance though of education while families were in the hospital. Many of the conditions I have seen in Paediatrics are communicable and grossly preventable, so the opportunity to educate while families are in the hospital setting is essential. At this point, I’m a little over a week into my stay and almost at the end of the mourning period. Next week I’ll be continuing paediatrics and then after that, adventures somewhere else in the hospital.